I had put a lot of thought into getting one of the new 'slipper clutches' that have cropped up on the aftermarket and onto some of the very new sportbikes. They are very expensive, between $750 and $1200. I had an idea of how one might help my riding, but was really hesitant to spend the real money to give one a try. I figured that I would just gain a bunch more control of the bike if I downshift hard in various places. Turns out I was dead wrong. One day, while driving my car home, I decided that I just had to give it a shot. I rushed into the house and had a Yoyodyne slip clutch sent off to my house. This way I would not change my mind again. The $795 plus shipping was not flushed down the drain. Almost a month went by before i had the chance to install the unit. I was pretty busy. The difference is staggering. Transformative. It is almost like my stock clutch was always broken and now it is fixed. 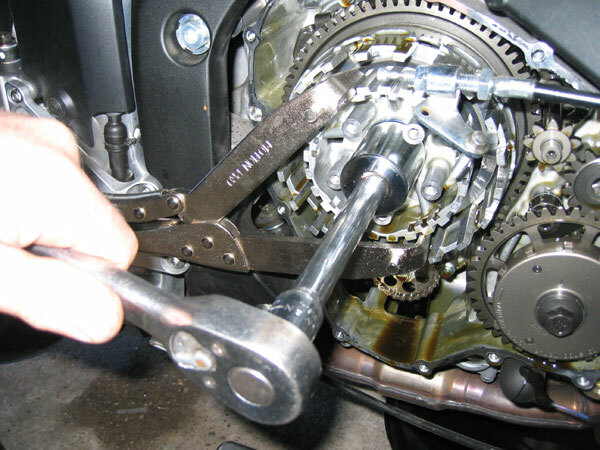 Engine breaking is down to a minimum at all times and the bike rolls so much smoother in every situation. The bike is so much smoother and is set up for every corner entry. The suspension is disrupted far less during corner entry, and especially while decending. Basic riding is almost glass like. I have a lot to learn to get fully used to it, but the benefits were realized on the first ride. The best analogy that I have come up with is that the bike rides more like a road bicycle. I break when I want to, not just because I get off the gas. On a road bicycle, I charge on decents. I power hard and only let up deep into a corner. That same frame of mind is rising up now on the motorcycle. I am really happy about this. One lame side effect of the mechanism is the crappy feel that the clutch lever has. All BTLC's will exibit this behavior due to the baskets winding up. That goes with little notice as I have much less of a need to even use the darn thing. 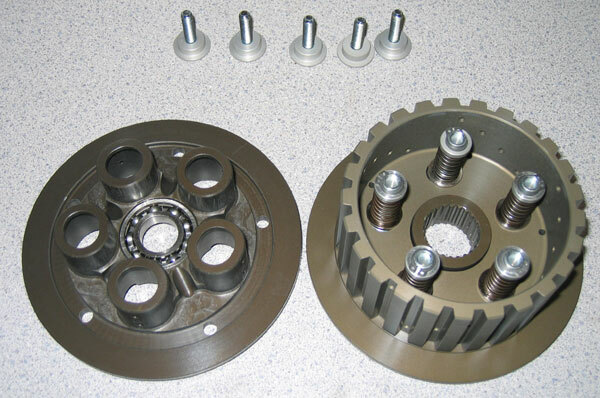 If you are a very aggressive street rider or track rider, you will not regret getting a slipper clutch. It is well worth the money on many levels. The cost is a bit more than a slip on pipe. So don't get the pipe and save up for the slip clutch. You WILL ride faster, smoother, in more control, and safer. This is what I call a "WOW!" modification. You instantly cannot live without it. Changing the springs that you see here changes the slip rate. Softer spring = less engine braking, stiffer springs = more engine braking. When drive forces are going backwards through the system, the inner basket rides these bearings up the ramps. 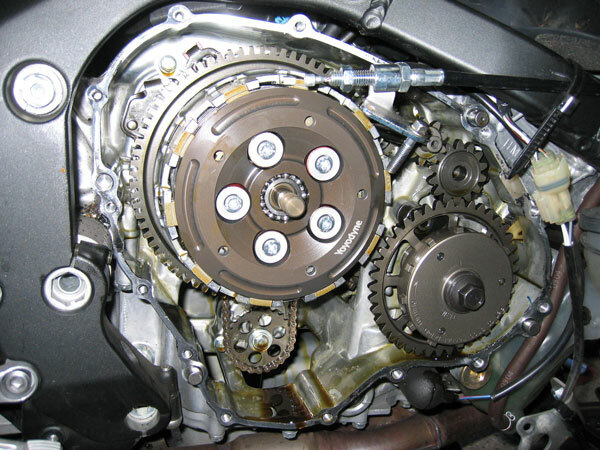 This movement creates an effect just as if you had disengaged the clutch by that amount. The system attemps to find an equalibriam between the back torque forces and those of the slip springs. The clutch will never fully disengage, but will drag only a set force. 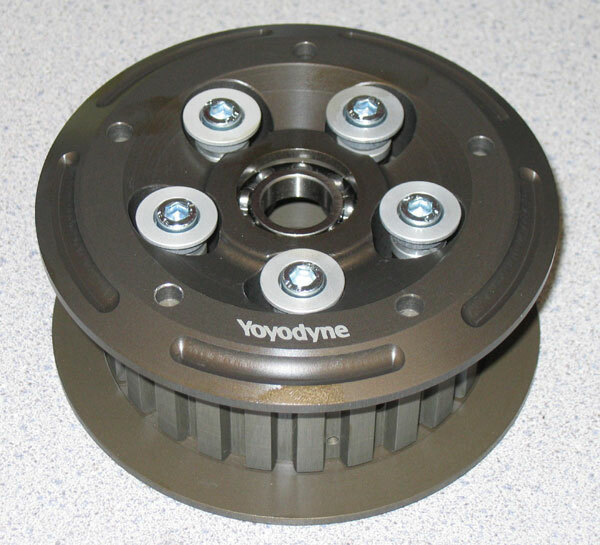 The only difference between the stock unit installation and the Yoyodyne installation is the first friction plate of the stack. In stock form, the first plate, deepest into the engine, is slightly different than the rest and shares the space with a belville spring and washer. This plate is moved into the second position for use with the slip clutch. If this is not done, the washer will jam the sippers mechanism. Some superbike preps will just replace this plate with a standard type plate. You will be fine as long as the total stack height remains the same. Street bikes should keep the plate and move it's position. The clutch is in, ready to seal it back up. 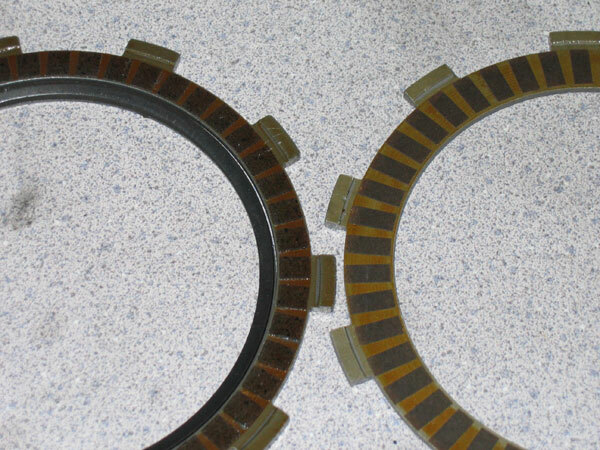 Take a look at the wet clutch plates above and the dry ones below. Notice the difference? 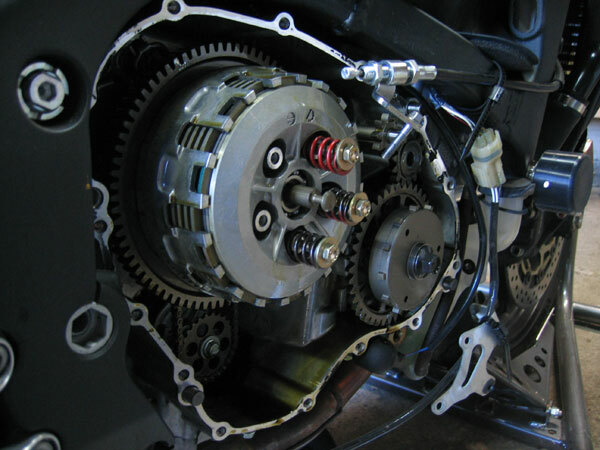 The CBR600RR uses 3 different types of clutch friction disks. 22201-MAS-E00 (qty. 6), 22201-MAE-000 (qty. 1), and 22202-MAE-000 (qty. 1). 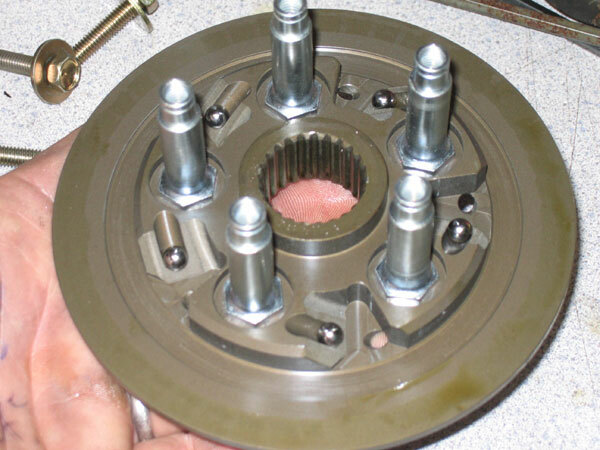 22201-MAS-E00 are the six friction disks that work against the steel plates within the clutch. 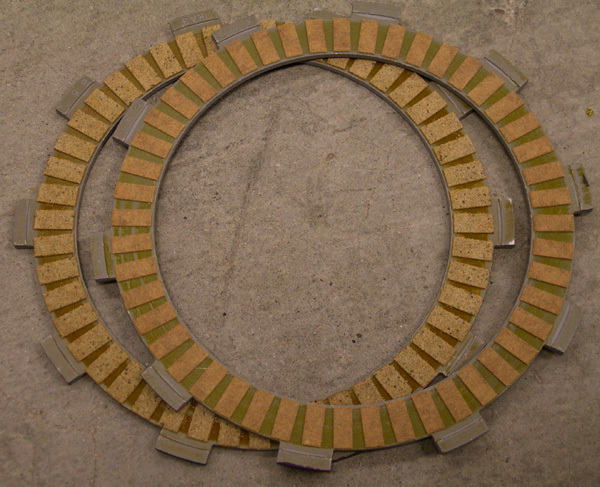 22201-MAE-000 is the friction disk that works against the aluminum on the outer side of the clutch. 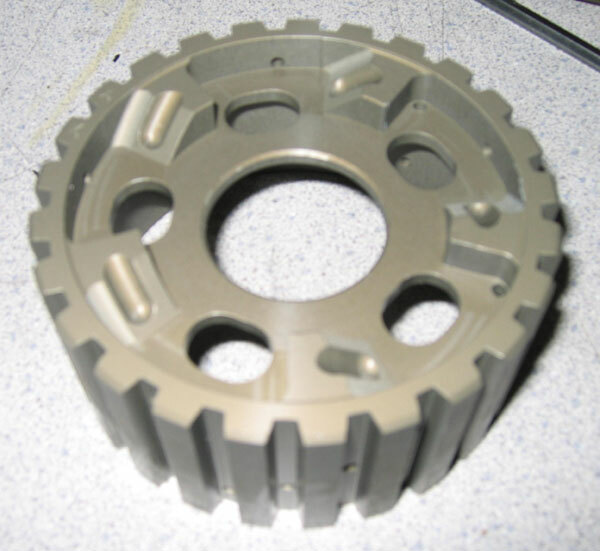 22202-MAE-000 is the smaller friction disk that works against aluminum on the inside of the clutch. This is the one that sits around the belville spring and washer. According to the installation that I did above, I switched the position of the last 22201-MAS-E00 with the 22202-MAE-000 to keep the belville spring from jamming the slip mechanism. This may have been a mistake in a way. The friction material of the 22201-MAS-E00 is obviously different and designed for use against steel. In the current configuration, it is now working against aluminum. This cannot be good. Next time I have my clutch open I plan on replacing that 22201-MAS-E00 with an additional 22201-MAE-000. This makes sense intuitively and hopefully will help the aluminum parts of my clutch last longer.